Enid Mary Blyton (11 August 1897 – 28 November 1968) was an English children’s writer whose books have been among the world’s best-sellers since the 1930s, selling more than 600 million copies. Blyton’s books are still enormously popular, and have been translated into 90 languages; her first book, Child Whispers, a 24-page collection of poems, was published in 1922. She wrote on a wide range of topics including education, natural history, fantasy, mystery, and biblical narratives and is best remembered today for her Noddy, Famous Five, and Secret Seven series. 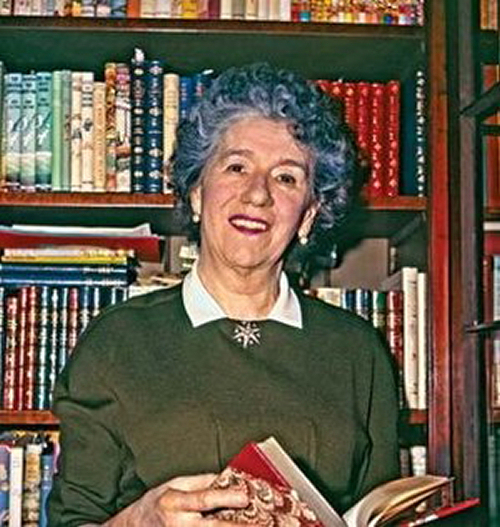 Blyton’s work became increasingly controversial among literary critics, teachers and parents from the 1950s onwards, because of the alleged unchallenging nature of her writing and the themes of her books, particularly the Noddy series. Some libraries and schools banned her works, which the BBC had refused to broadcast from the 1930s until the 1950s because they were perceived to lack literary merit. Her books have been criticised as being elitist, sexist, racist, xenophobic and at odds with the more liberal environment emerging in post-war Britain, but they have continued to be best-sellers since her death in 1968. Blyton felt she had a responsibility to provide her readers with a strong moral framework, so she encouraged them to support worthy causes. In particular, through the clubs she set up or supported, she encouraged and organised them to raise funds for animal and paediatric charities. The story of Blyton’s life was dramatised in a BBC film entitled Enid, featuring Helena Bonham Carter in the title role and first broadcast in the United Kingdom on BBC Four in 2009. There have also been several adaptations of her books for stage, screen and television. Posted by boutje777 on July 18, 2018 in Uncategorized. Let’s not forget artist, Harmsen van der Beek who did those excellent illustrations of the Noddy characters for the children’s books. I don’t believe Noddy would have been so popular without them. So nice to see a full list of her books. I loved Blyton as a child and still do.